WebTeam Corporation was founded at a time when autism intervention in the classroom was largely unstructured. Back in 2007 and the ensuing couple of years, WebTeam was busy experimenting with a few technologies to ascertain if teachers could benefit from using touchscreen kiosks in the classroom. The experimentation led to the development of kiosk-based Colors Program, which, together with the app-based iLearnNEarn program that was put to use in 2011, charted a new horizon in autism treatment by extending classroom intervention to homes and therapy centers globally. Since January 2012, WebTeam’s autism apps have registered 1.2 million downloads across iTunes, Google Play, Nook, and Kindle, while delivering 10,000 daily sessions on average. WebTeam Corporation believes in, and has in place, a synchronized and holistic method of intervention delivery across homes and schools. The Colors Program is a tool of empowerment for teachers who have to deal with a lot of challenges on a regular basis. Available at the kiosk, the Program can deliver extended evidence-based therapy like applied behavior analysis (ABA) to children with learning disabilities or individuals with autism spectrum disorders. 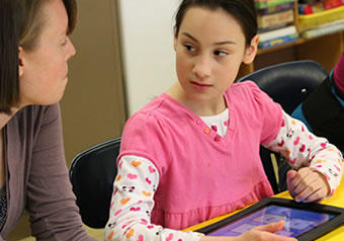 The iLearnNEarn program, on the other hand, uses the touchscreen technology to deliver intense early intervention to the special needs population. One of the major benefits of this integrated technology is data collection. We track each and every touch on the screen and record a student’s facial expressions and physical behaviors for further analysis and research. The patent-pending Colors Program not only delivers IEP-driven intervention, but also takes into account every student’s personal interests and preferences. WebTeam has a fully integrated tracking and monitoring system that allows parents, teachers, and therapists to track critical data about the student’s progress and have access to instant reports. Our mission is to increase the bandwidth of school districts and service providers to accommodate the increasing number of students with autism, ADHD and Asperger’s. To get where we want to see ourselves in the next couple of years, we are in process to develop structured, curriculum-driven apps for Apple, Android, NOOK, and Amazon marketplaces. As of October 2013, we have over 150 apps available on iTunes, Google Play, Nook, and Kindle.